Give your outgoing mail a distinctive look when you add a sophisticated finishing touch using these return address labels. 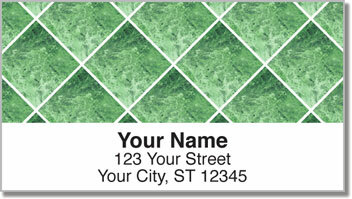 The elegant yet simple appearance of Marble Tile Address Labels from CheckAdvantage exudes professionalism and allows you to personalize letters and packages with a bit of color. The set comes in four styles including classic gray and blue to more vibrant red and green. Choosing these address labels is a smart move. You'll save yourself the hassle of writing your name and address on every envelope every time. Instead...you can simply peel, place and move on! Order your very own Marble Tile Address Labels right now! Make it all complete when you also order matching personal checks.